breads candied fruit eggnog eggnog bread gift this! It's hard to believe we're just a few days away from Christmas. I hope everyone is soaking in every last little bit of happy this season has to offer. Around here that means sniffing cut pine wreaths at the market, wrangling the pugs into Christmas pajamas and incorporating eggnog in as many sweet things as possible. I was surprised at how much I loved this quick bread recipe. It calls for candied fruit, and I very reluctantly picked up a bag of fruitcake mix. 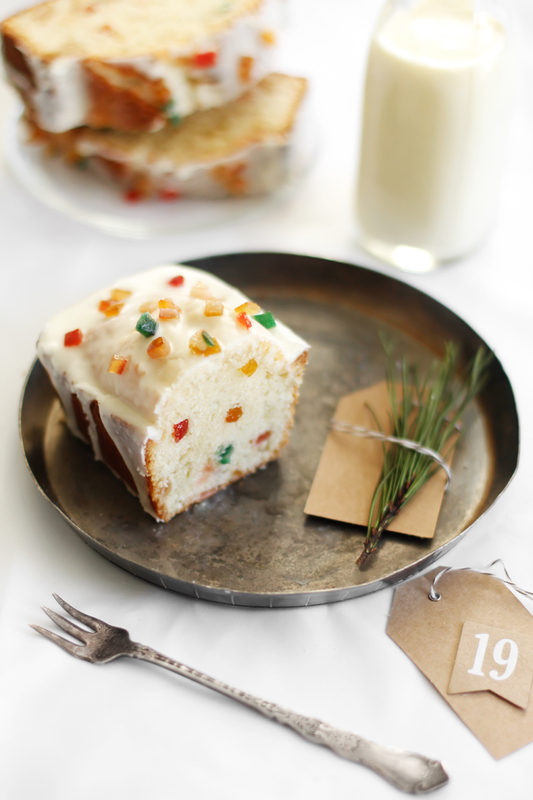 This bread is not at all like fruitcake, though. It's fluffy and sweet with just the occasionally chewy bite of candied fruit. This recipe makes two loaves, so you can keep one for your family and give one away. 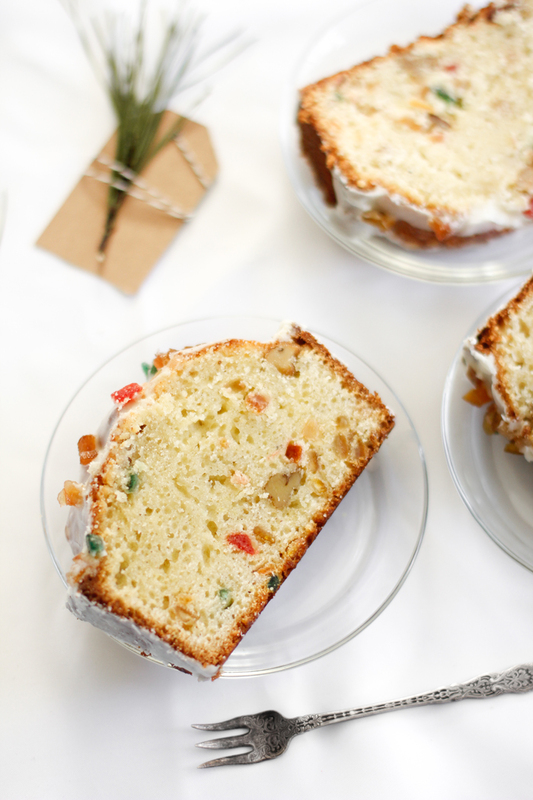 The candied fruit makes the bread look jeweled inside and out, and the eggnog flavor is so season appropriate. This recipe calls for commercially prepared eggnog for the bread batter and the glaze. I used Southern Comfort brand (alcohol-free version). Make the bread: In a large bowl, beat eggs, eggnog and oil. Add the sugar and extracts; mix well. Combine 2-1/2 cups flour, baking powder, salt and nutmeg; gradually add to egg mixture. Toss the fruit with remaining flour; stir into batter. Fold in walnuts. Pour into two greased 8 x 4 x 2-in. loaf pans. Bake at 350° for 60-65 minutes or until a toothpick comes out clean. Cool for 10 minutes before removing from pans to wire racks to cool completely. Make the glaze: Stir the eggnog into the confectioners’ sugar 1 tablespoon at a time until a thick glaze forms (you may not have to use all of the eggnog). 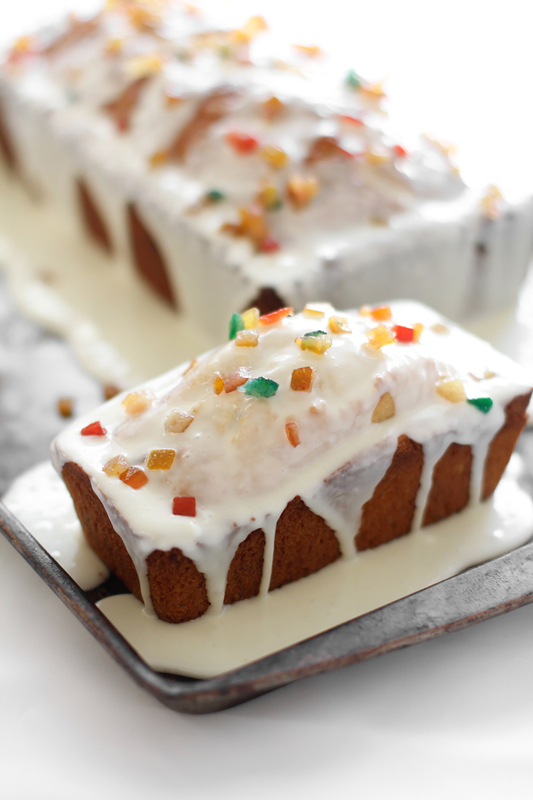 Drizzle the glaze over to the two loaves and top with additional candied fruit, if desired. Let the loaves stand until the glaze is set, about 1 hour. Transfer to airtight containers, or package in large gusseted cellophane bread bags for gift-giving. This eggnog bread is such a beauty! 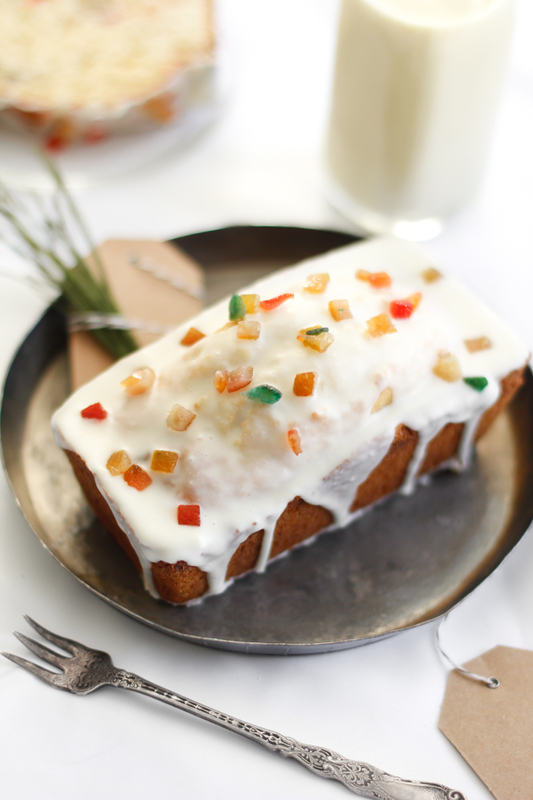 Can't decide which I love more - that eggnog glaze, or the colorful candied fruit on top! :) Love it! I just recently found your blog and I've already spent hours scrolling through your posts and looking at all your recipes. The treats you make are absolutely beautiful and look super yummy. With the holidays coming up, I was thinking of making your rosemary shortbread and almond florentine cigar cookies for my teachers. Since I'm giving these treats as gifts, I was wondering if you have any tips on how to gift them in spirt of the holiday season (maybe even make a post on gifting treats?). Thanks! LOVE YOUR BLOG SO MUCH!!! Hi Andy, coconut eggnog should work fine. Your batter may be slightly thinner than it would be with regular eggnog, but with the eggs and and leaven it should raise nicely. Thanks for asking! Do you believe this recipe would work with prepared eggnog which does contain alcohol? Yes! I think it would be wonderful in this bread.